My brother was one of my groomsmen— above on the right: you see him ready to give a pamphlet at church to our guests. On the right: a photo of my messy desk making these pamphlets. Baybayin calligraphy is such a beautiful script— ancient, under-appreciated, and relatively unknown even to Filipinos. Baybayin was used by ancient Tagalogs in the 13th century— before Spanish/Japanese/American colonization. There are a few scripts similar to Baybayin still used today such as the writing system by the Hanunoo, a Mangyan sub-tribe in the island of Mindoro in the Philippines. Right now, it is a script gaining popularity, especially by Filipino-Americans in art, tattoos, and graffiti. We finally had our wedding ceremony (we’ve been legally married for a few years but finally saved enough for a church ceremony and reception)! It was awesome and something I still daydream about daily! It was stressful to organize, but totally worth it to see all these different people from different parts of my life dancing and partying together. Part of the wedding planning included creating a pamphlet for our guests. 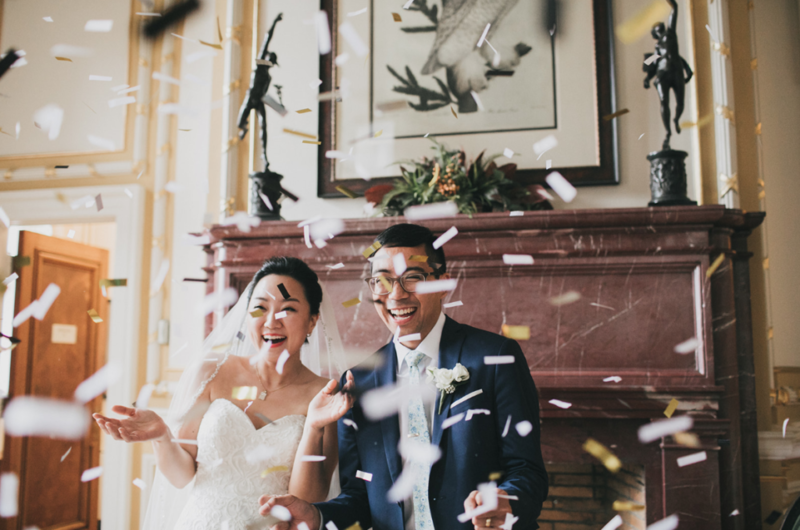 My wife is Korean and we wanted to give respect our respective cultures. 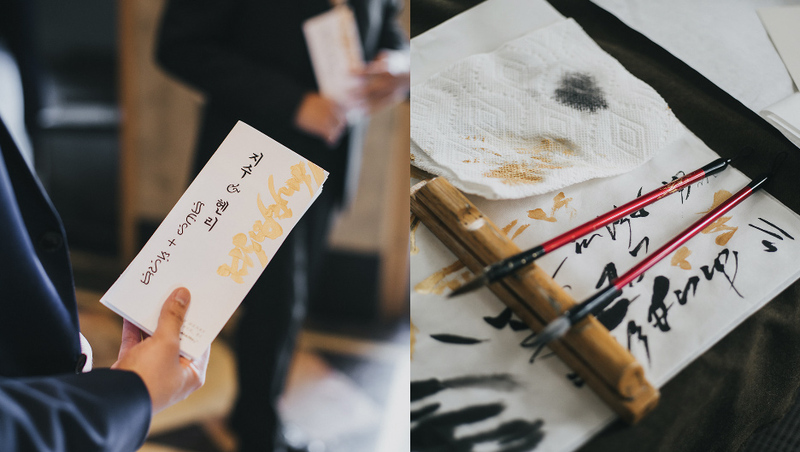 We did this by providing much of the text of our wedding in both Tagalog, Korean, and English. You can see the cover of the pamphlet we gave our guests at church. It says “Jisoo and Henry” in Filipino Baybayin (on the far left) and Korean (the next column). The right-sided gold calligraphy is in Baybayin script saying “isang pagmamahal” which translates to “one love” in Tagalog. This is the monogram-like graphic we had on our cards and website. 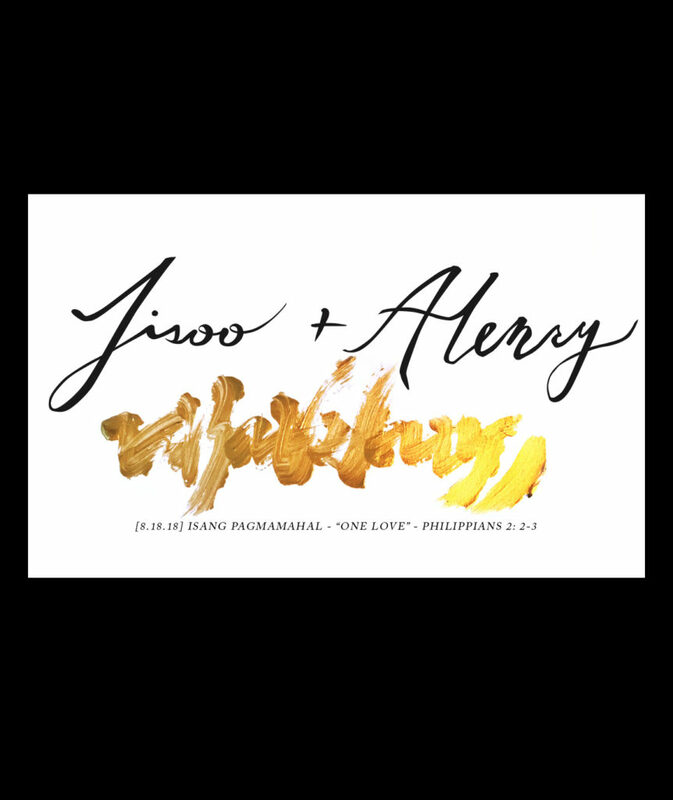 “Jisoo + Henry” was also created with a calligraphy brush, scanned, and then cleaned up in Illustrator. What’s the point of being “one”? These verses suggest the purpose is so that we can love others. We center on these verses because it’s heart moves in a direction that we want our lives to move: Christ > being one together > loving others. The direction is not inward. It’s a divesting of ourselves. The arrows point outward. Another reason these verses suggest itself as a well-known hymn at the time is that in the original Greek, the vocabulary uses words uncommon and grammar atypical compared to other writings by Paul. It would be as if I started writing in Shakespeare; ye would nary notice voice different if not by painter’s form and art. In medicine, we have technology and modern advancements to help us relieve suffering. Part of my work, apart from hospital medicine or obstetrics, is to care for people as their primary care physician in clinic. I see some patients monthly, coaching them through their diabetes, hypertension, weight loss, etc. But I also help them through grief and loss, being homeless, being lonely and depressed. Medicines and therapy can help people through these psychosocial pains, but the more people I see, the more I learn people yearn for something deep in their hearts: they want meaning, purpose, and community. I think it takes humility for a doctor to realize what medicine can and cannot do. My wife is a physician as well (pulmonologist and critical care doctor) and as we learn more about the world, what place we have in it, and how God will use us for his glory— we pray that our medicine and our marriage center more and more on Christ’s love and servant’s heart.